This "Free Puppy Social Club" is for up to 20 weeks puppies that have one set of shots done. You and your puppy will have lots of fun by socializing with other puppies!! This is not a training class but Yoko will show you what is a safe puppy play and the body language you'll need to know so that it will be easier to understand your puppy. In addition, every Puppy Social Club participant will receive in-store Paw Street Market coupons | 20% Off treats | 5% Off food and litter. -Some tips for potty/crate training. -Maximum puppies are 4 every week. -Please bring some treat and poo bags. Registration is by the contact form on Bow Wow Academy website. "Puppy Socialization Class" - for puppies 8-20 weeks old"
Hosted by Laura Young - "True Friends Dog Training"
Cost: $10 drop-in | First set of vaccinations required. 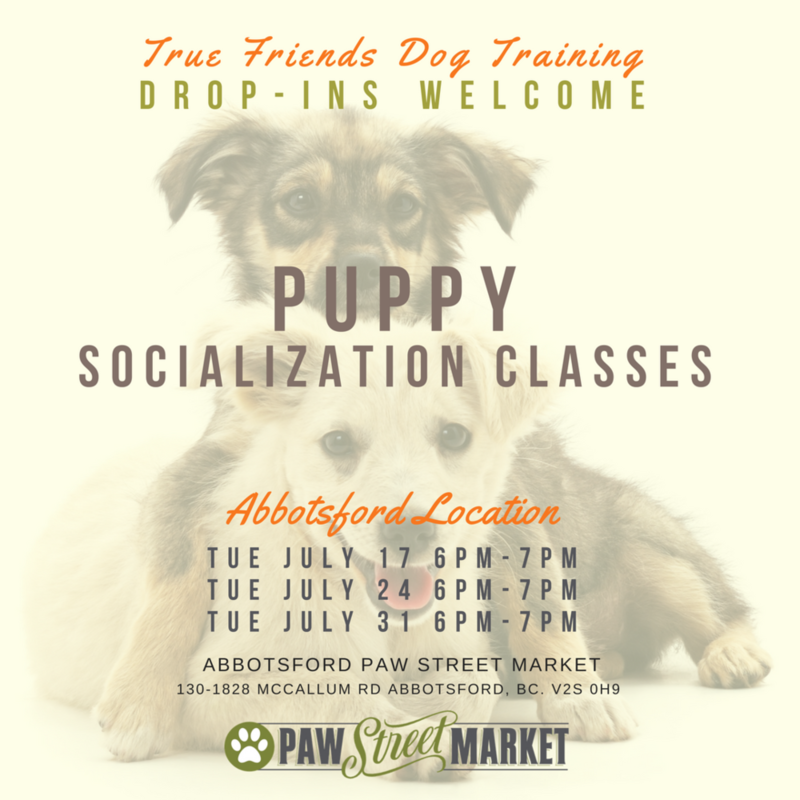 Drop-in Puppy Socialization Class for puppies aged 8 - 20 weeks old. $10.00 fee. Puppies must have received their first set of vaccines at least 7 days prior to attending class. Please bring proof of vaccination(s). We will also require you to sign a liability waiver in order for your puppy to participate. The first 16 weeks is the most important period of development in a dog’s life. During this short gap of time it is critical to begin exposing your puppy to as many new and positive experiences as possible. During this class your puppy will get the chance to meet new people, play with other puppies, practice bite inhibition and self control as well as learn valuable social skills. Our focus is to socialize your puppy and build his/her confidence in a clean, safe and controlled environment. A certified professional dog trainer will be supervising the puppies interactions at all times. Hosted by Laura Young -"True Friends Dog Training"